We delivered our first project in 2013, working on a tiny grant from Redbridge Arts Grants. Since then our projects have got bigger and better and more diverse. We continue to run our main project - You, Me, the World and... - but we also deliver work in a variety of other settings outside our main project, with theatres, charities, corporations and community groups. This project engaged 12 community groups and over 350 participants, spanning 9 months in 2017 and 2018. We worked with primary school children, secondary school students, and elderly residents; employees of local businesses and the homeless; walkers groups and gardeners; engaging each in workshops and performances. 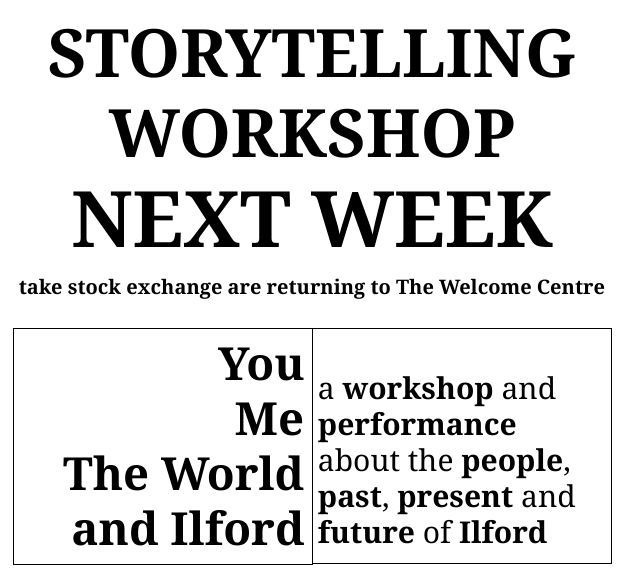 At the end of the project, we invited those groups we worked with, as well as the wider Tower Hamlets community to a free event at Rich Mix, to share in a communal meal, and listen to a selection of stories that we’d heard from around all over the borough. Made in partnership with The Yard Theatre and Rich Mix. Funded by Tower Hamlets Borough Council. In this video we hear from some of the people we met at the final sharing of You, Me, the World and Tower Hamlets at Richmix in July 2018. In the three videos below, Olly and Nick discuss the three themes that emerged during the 9 months we spent delivering You, Me, the World and Tower Hamlets. Old residents, new residents, artists, workers... Hackney Wick is changing and we wanted to hear from the residents. 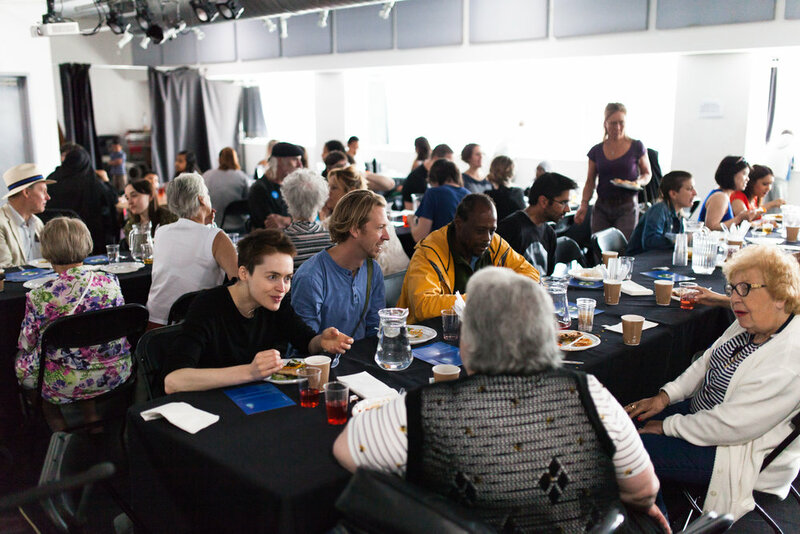 Over the course of many months, and in close collaboration with The Yard, we engaged over 20 groups living in and around Hackney Wick. We listened to stories of change, challenge and hope. Groups ranged from local schools, tech start ups, cafes and gardening enthusiasts and their rich, diverse and moving stories were shared, by us, at The Yard over food, drink and a performance. Made in Partnership with The Yard Theatre. Funded by Arts Council England, Hackney Borough Council, Discover Young Hackney & The Wick Award. YARDLINGS: Big are The Yard’s littlest theatre-makers. They are almost entirely without filter. They run, stumble and play through daily life with incomparable freedom. Working in partnership with Mossbourne Riverside Academy, we have been colliding with 4-6 year olds all year, exploding conventions of what making art with children should be. We worked with The Yardlings for an entire school year, and at the end of it, created a show full of joy, chaos and energy. Working in collaboration with Stratford Circus, Amal, Minhaj-ul-Quran Mosque, St Angela's and Plashet Schools, we brought together over 200 people from all over Newham (and all over the world) to tell stories, to listen to stories, to celebrate commonality and to celebrate difference. This project was funded by the Amal - a Said Foundation project. … is a project that has spanned years, starting life in 2014 and developing over 2 more projects in 2015 and 2017. During this time, we have engaged more and more groups, collated more and more stories and became more ambitious than ever. It began life as a commission in Ilford from Vision Redbridge as part of their 'Ilford This Way' scheme and has since been funded by Arts Council England and Redbridge Borough Council. I first met Nick and Olly at The Welcome Project, a day-centre for homeless people. I remember putting all the chairs together in a circle, waiting in anticipation for something that would bring a bit of colour into our daily routine. Our first project back in 2013. We engaged five community groups and listened to and collated stories from all. Passionate about addressing the empathy deficit that can exist among communities, we shared the stories we collated with each group. It was during this project that we began to shape the aims for our work. Our objective was to create for participants the opportunity to develop their awareness of how they view themselves, engage with other people, the place they live, and the wider world; to create a space where participants could engage their imagination and be creative, responsive and attentive to their own thoughts and feelings, to other people and their wider environment.